Explore Like a Local: Springtime Action in the Colorful Wildflower Abundance of Northern Nevada. Reno Tahoe Territory’s Must-do Checklist for a Rewarding Story-Worthy Vacation. RENO-TAHOE TERRITORY, Nevada — Rarely can your action seeking travels be as effortless as in this part of the world thanks to the proximity of the nearby towns of Reno/Sparks, Carson City, Virginia City, Carson Valley, North Lake Tahoe and South Lake Tahoe. And because every day should include some type of unique active exploration, here are the top picks to inspire your spring season adventure choices in Nevada’s Reno-Tahoe Territory. 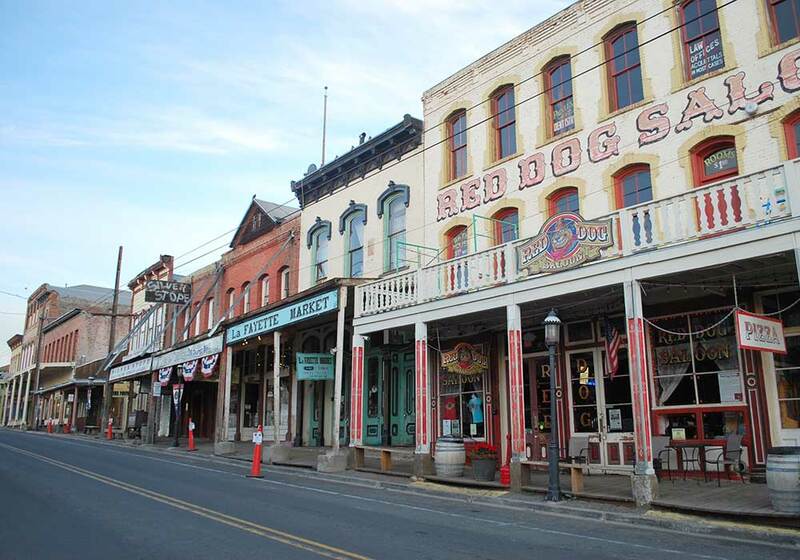 When USA Today recognized Virginia City as one of its top 10 “Best Small Towns in the Southwest” it definitely had this town’s authentic and quirky events in mind. And the springtime season certainly welcomes a line-up of delicious events to help you savor the journey. This small mountain town is also a patriotic town, so there’s no better place to honor our country’s servicemen and women who paid the ultimate sacrifice than at the Celebration of Heroes Parade. The parade makes its way down the town’s main drag on Memorial Day, while throughout the weekend, red, white and blue adorns the shops, seasonal tours and attractions open for the season and visitors are invited to enjoy this “kick-off” to summer. Details HERE. Taste of the Comstock takes place in June to offer up an inside glimpse of the town’s heritage from mining history and educational museum tours to whiskey and cigar tasting. Immerse in the history of the Comstock with its delicious food while relishing in the experience of the way it was in its heyday. Details HERE. Head downtown to the nerve center of cultural heritage and a multitude of Themed Museums. Get an inside glimpse of Mark Twain’s writing and learn more about the bonanza king telecom giant John Mackay, the town’s connection with famous Madame Julia Bulette and the role of a Civil War general. Visitors are invited to experience more than 15 museums from May thru October. Details HERE. Farm to table meets worldly aesthetics at the Canvas Café offering a personalized and custom made-to-order menu. With stories to tell on the Comstock and many to take back home, the Blank Canvas special is a must-try. Enjoy the ambiance, patio dining, and friendly staff surrounded by the works of local artists. Details HERE. Head out to the western frontier to experience a rich Cultural Heritage and lore as this valley boasts a variety of authentic historic sites and museums where visitors can immerse themselves in the real lives of the early settlers. Place yourself in Kit Carson’s life of travels and see first-hand, Snowshoe Thompson’s contributions to the old west. The Pony Express and Emigrant Trail still await every traveler at these amazing preservation sites. Details HERE. The local’s favorite Carson Valley Golf Course is situated on the banks of the Carson River among giant cottonwood trees and for family fun, ask about its Foot Golf Course. 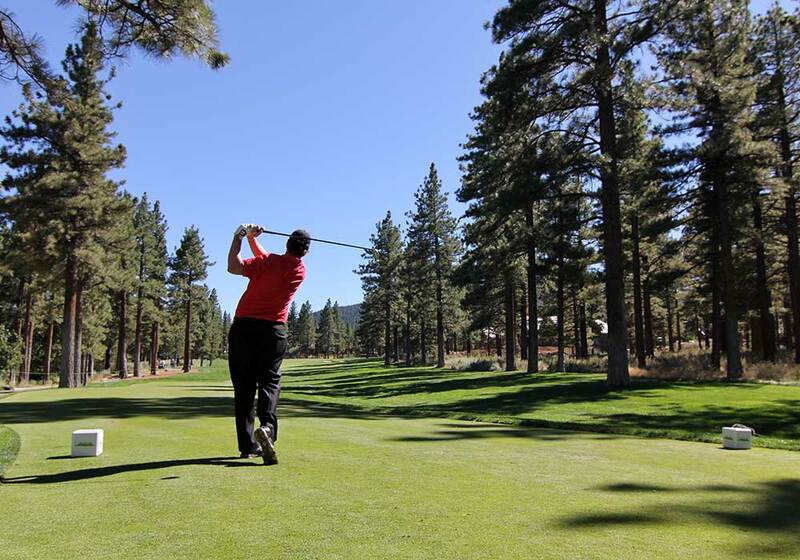 For luxury golf head to either Lakes Course in the lush wetlands making long, straight drives the order of the day or Resort Course, built for power and distance cutting into the rugged Sierra Nevada foothills. 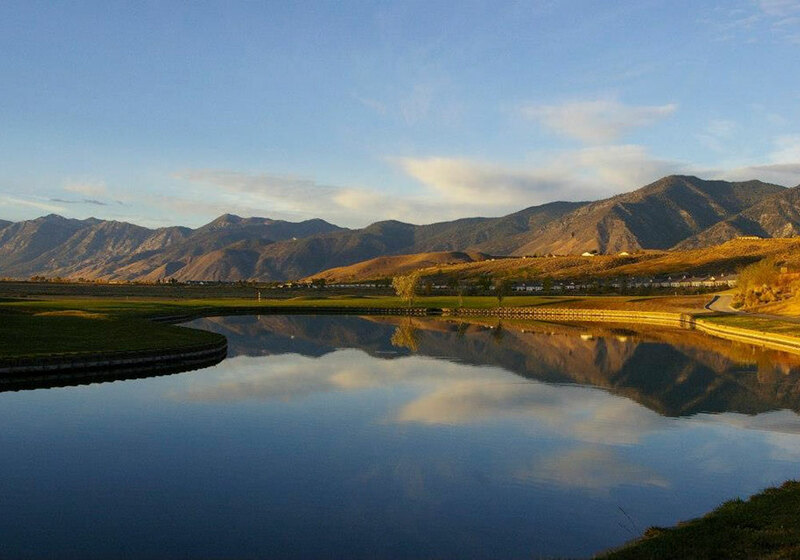 The Sunridge Golf Course winds through the breathtaking vistas of the Carson Valley. 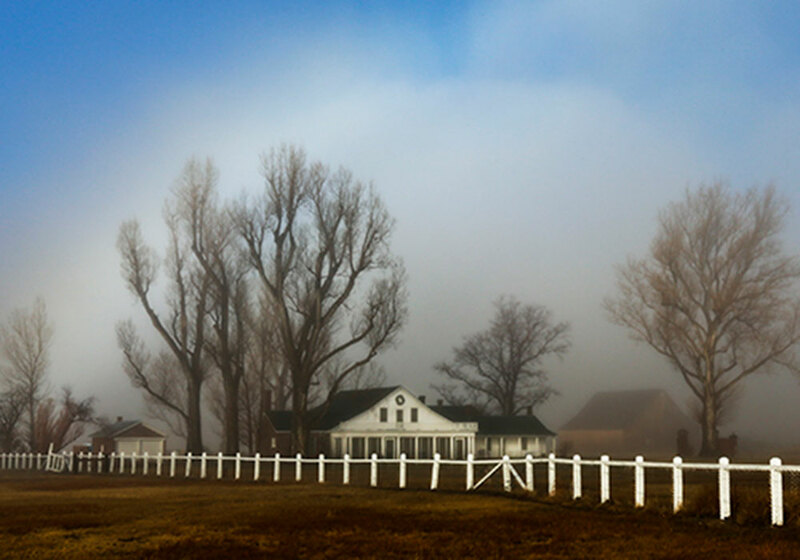 The Dangberg Home Ranch Historic Park preserves an essential chapter in Nevada’s history and features a house built by a family that played an important role in the shaping of Carson Valley. With an engaging collection of artifacts, photographs and documents dating from the early 19th century, this cultural heritage experience is a rare opportunity. Details HERE. The Overland Restaurant & Pub is open daily and it prides itself on being a fresh, farm-to-table style restaurant. Built in 1910, the historic building once boarded Basque sheepherders and was originally a meat market. Details HERE. 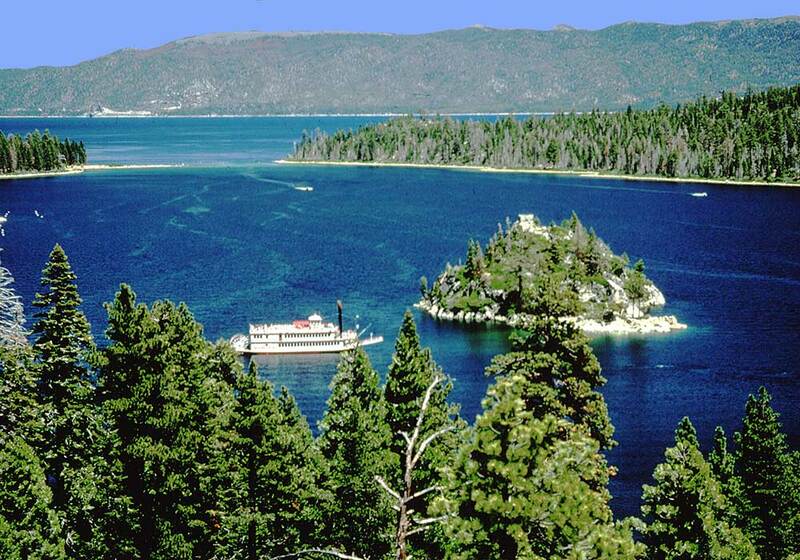 A relaxing way to absorb the amazing and pristine views is to take the 500-passenger paddle wheeler M.S. Dixie II which is also the largest cruising vessel on the lake. Join the locals on a daily sightseeing cruise from Zephyr Cove Resort to stunning Emerald Bay while you’re all enjoying cocktails on the way back. Lunch and dinner cruises are available. Details HERE. What’s Next? Explore the true wilderness along the Tahoe Rim Trail where your hike greets amazing vistas, high alpine lakes, meadows and snow-capped peaks. One of the most rewarding experiences in the Basin, hit this trail on either a guided hike or on your own. There are many local-endorsed recommended hikes to explore. Details HERE. 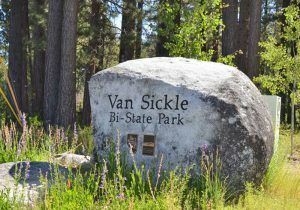 Van Sickle Bi-State Park on the Nevada/California border is just steps from the Stateline casinos offering quick access for hiking, picnicking, mountain biking and horseback riding. 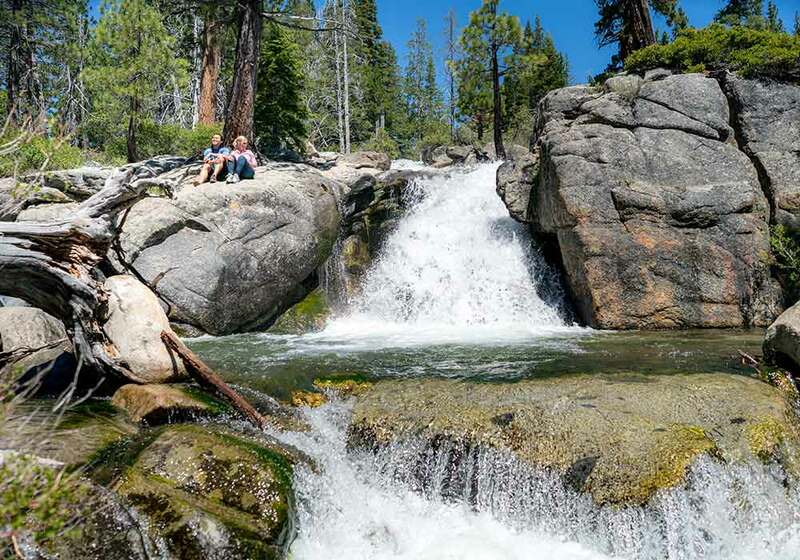 With trails leading to beautiful waterfalls and majestic views of Lake Tahoe, it’s the only bi-state park in America that shares a common entrance. Pedestrian access is year-round (vehicle access May – October). Details HERE. Located on the 19th floor of Harveys at Stateline, the 19 Kitchen – Bar boasts dramatic views while serving up spirited flavors. An eclectic yet welcoming menu can be enjoyed in an intimate booth with lake views from every table. Details HERE. Established in 1946 and rich with history, take in the excitement of Nevada style gaming at the Tahoe Biltmore Lodge. The colorful casino sports its original traditional atmosphere with a friendly staff and affordable lodging. Details HERE. Locals recommend the calm of getting on a standup paddleboard early morning along the quiet and secluded East Shore. The Nevada State Park offers a short carry access point and you’ll soon be in the rocky coves looking down at the turquoise waters. The word-of-mouth dual sports badge is a local tradition with skiing in the morning and an afternoon paddle. 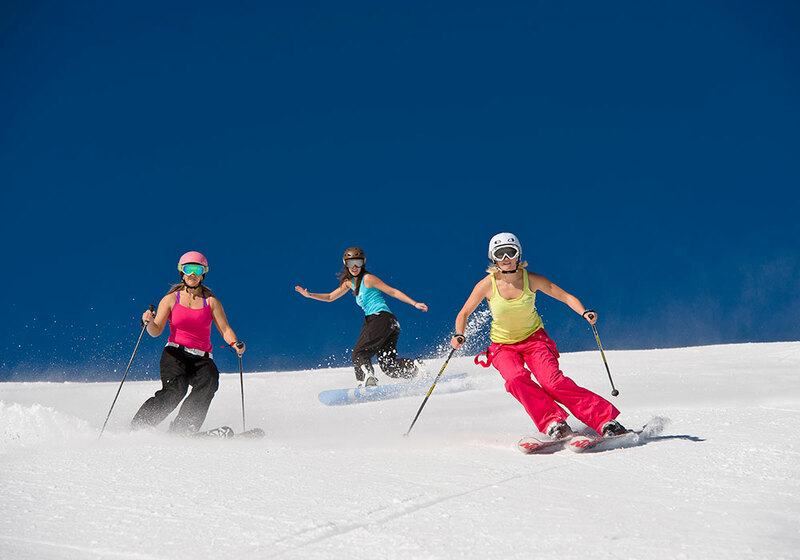 Ski Mt. Rose early and then rent your paddle at the easy access boat launch at Sand Harbor. The north cove is typically protected from afternoon winds and you can cruise up the amazing waters of Crystal Bay or down along the rocky East Shore past the historic Thunderbird Mansion. Fredrick’s Fusion Bistro, or ‘Fred’s’ as called by the locals, is a laid-back, elegant dining spot in the heart of Incline Village. Entrees are seasonal with fresh ingredients serving Asian fusion fare, wine & specialty martinis in a compact, romantic dining room. Details HERE. 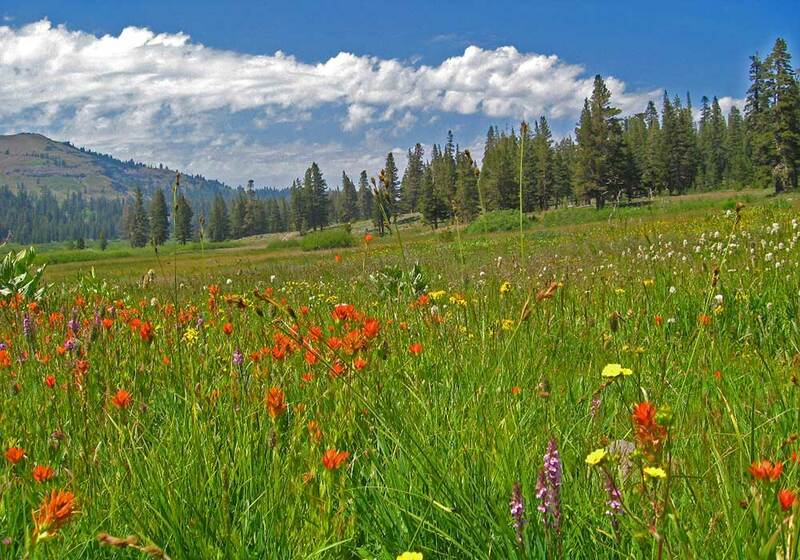 Take in the vibrant wildflowers as you hike or bike along the award winning Ash to Kings Canyon Trail. Journey over two creeks, above a waterfall, climbing from the valley floor into the higher elevation of pine forest and passing rock formations. With amazing views of Eagle Valley, Washoe Valley, Carson Plains, and Carson Valley, you’ll see mountain ranges 100 miles a way. Details HERE. 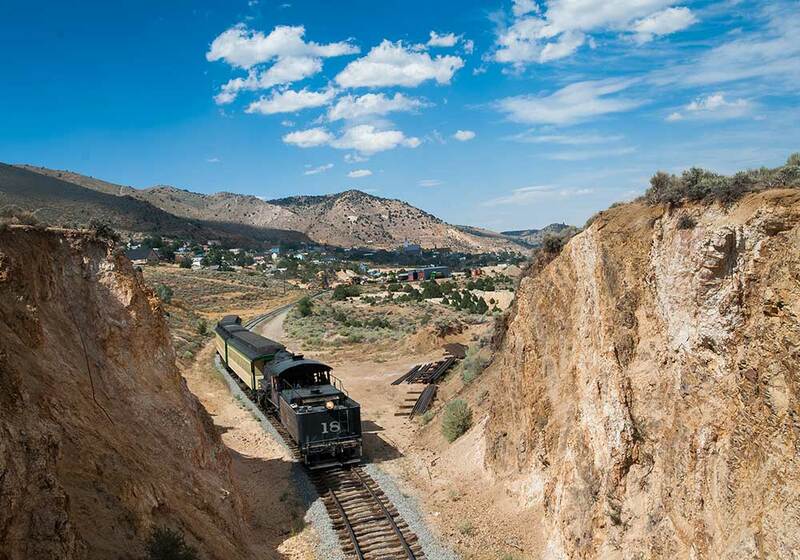 Experience the rich railroad history of the old west on two authentic engines that still operate today, Nevada State Railroad Museum and the V&T Railroad. Share your Carson City train ride on Instagram with #RideCarsonCity and receive a thank you gift plus a chance to have your picture featured. Details HERE. 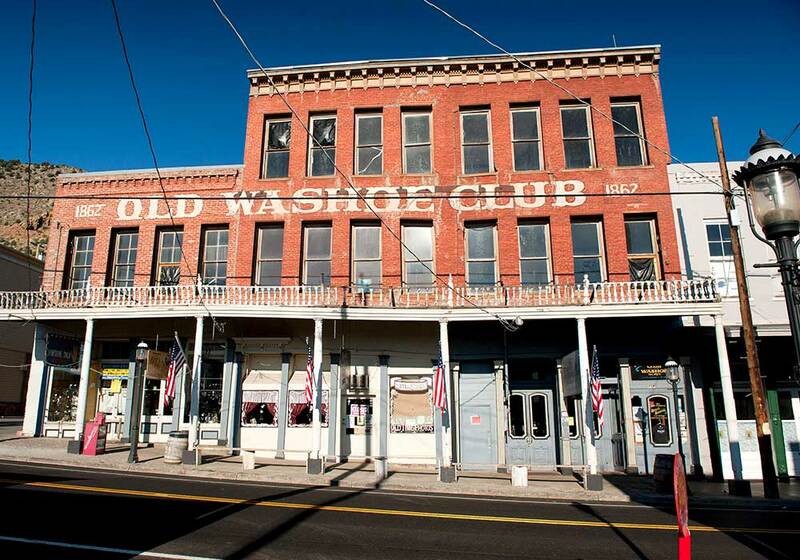 Explore the historic west side and learn the story of Carson City while taking in the landmarks and 1800s-era Victorian-style homes along the Blue Line Trail. The Kit Carson Trail is a walking path that follows a painted blue line dotted with bronze medallions along the sidewalk. Details HERE. Adele’s Restaurant is a local gathering hot spot, rich in history and known for locally sourced cuisine. The fourth-generation family-owned culinary delight operates inside a restored 1864 Comstock Mansart Victorian to offer a warm inviting, award-winning experience. Details HERE. 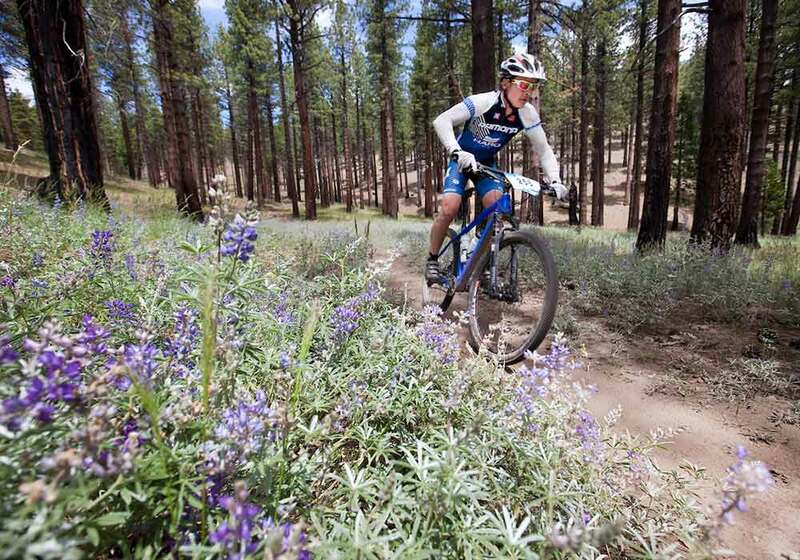 Spring is such a magical time in Reno Tahoe, and the perfect time to get outside. Visit any of the hiking trails in the high-desert or the foothills and see the blooming wildflowers, rushing creeks and waterfalls. Details HERE. America’s favorite pastime is also a Reno Tahoe springtime tradition. The Reno Aces are an AAA-Affiliate and play home games in the heart of Downtown Reno. Detail HERE. The Reno River Festival is the event of the season in Reno. 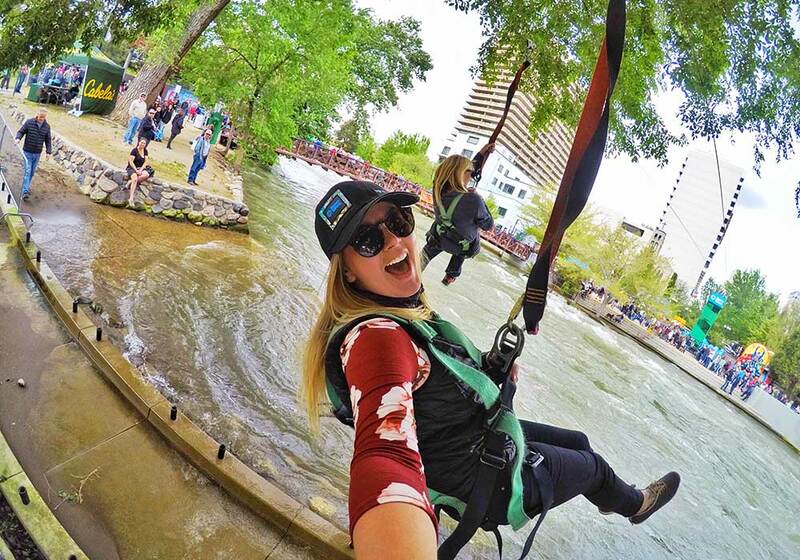 For two full days, Wingfield park transforms into adventure headquarters complete with a zipline, craft beer village, yoga in the park, and of course the kayak competition. Details HERE. Celebrate spring by enjoying a delicious meal at one of Reno Tahoe’s fine waterfront restaurants. Choose between the majestic Lake Tahoe, the stunning Truckee River, or the exceptional Sparks Marina. Details HERE.